I love you man. Expect a large bouquet at your door. Someone, please make Graveyard, Lost World music. Best way: MIDI + ym2612 instruments. One channel = one instrument. Post any questions about it here. Did the Genesis version have a pause feature already in? I know the SNES did, but I thought it was extremely stupid that they disabled it unless activated in a cheat menu. Also we have changed "Sound" option into "Music" option. Because "Sound" - useless option. You can just turn off sound on your TV... But how to play with SFX only?) 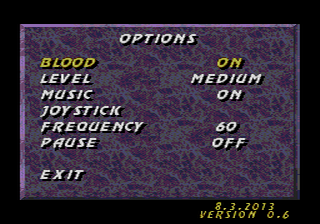 Now you can turn off Music, and play UMK3 with SFX and custom music. Played the latest version. Gots the arcade intros and endings. Nice. Also, you added endings for Motaro and Shao Kahn. No more Motaro wins or Shao Kahn wins. Edit: Think you can add 1 button finishers, like in the SNES version? That was handy. I tell ya, this hack seemed awesome, it's too bad the author don't seem to update it anymore. http://www.romhacking.net/hacks/3158/ I added the hack to the site. Where did you find this hack? Really good work, seems really useful hack. Who says that was even this hack? There's at least 3 UMK3 hacks I know of. That's probably a different one. gustavocomvoce, that is probably just art.